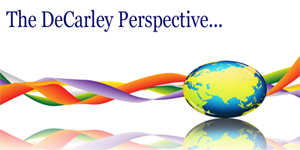 This commodity trading newsletter was emailed to DeCarley clients on June 27, 2010. U.S. investors spent much of May and June focusing on economic troubles overseas they seem to have overlooked the bright side. The cheaper Euro has already encouraged U.S. travelers to make their way into the hotspots of France and Germany. Also, it will make European goods and services more competitive on the global circuit. These two issues aren't going to turn things around on a dime (look at what the low U.S. dollar did for the domestic economy) but it suggests that there is light at the end of the tunnel. The dramatic re-pricing of the U.S. markets may have overestimated the turmoil in Europe, and worse, over accounted for the impact that overseas troubles will have on the recovery at home. The S&P near 1074 the market is trading at a 12% price to earnings ratio based on forecasts....and this is historically cheap. The recovery is vulnerable, but we already know that and so does the market. 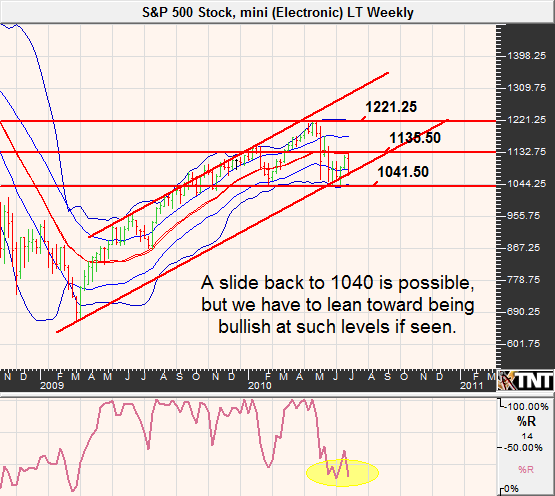 Barring a double dip scenario, the S&P should hold support in the 1040 to 1030 area, with the possibility of a spike low to 1017. Should prices be discounted to such levels again, it could be a great opportunity for the bulls. Keep in mind that there is a small chance of a slide to the 990 area in the September S&P, but it would take surprisingly weak fundamental news or a catalyst event for this technical chart pattern to play out. At this time, we are not counting on such a move. Treasury futures have managed to hold gains forged during the European debt crisis panic despite a recovery in the Euro and stocks. The difference in price action displays the discrepancy in opinion between stock, bond and currency traders. In the end, only one view will be accurate. Although market fundamentals and sentiment look dismal now, we have a feeling that bonds and notes have priced in a majority of the turmoil. Aside from a temporary spike higher in prices (lower in yields) it seems as though the path of least resistance should be lower for Treasuries. After all, the two-year note is currently hovering near it's late 2008 crisis lows in yield. A poor as the recovery has been, we don't seem to be suffering from the same magnitude of ailments that once existed. July is often a bullish time of the year for bonds and notes, but given the fact that the Treasury complex spent much of its "bearish" time rallying we aren't going to put too much faith into seasonal tendencies. In the previous newsletter, we noted a potential pullback in Treasuries to the 121 area and mentioned that we couldn't rule out a run back to 126. Those technical numbers ended up holding water but looking forward isn't quite as clear. We prefer playing this market from the bear camp, but see risk of a large and temporary spike that could bring the September 30-year bond to 127 or a little beyond before a reversal can occur. This translated into about 123 in the note. The grain complex failed to forge the typical spring rally and this makes it tough to be an aggressive bear. The recently quiet nature of the complex and the risk of a sharp short covering rally pose substantial risk to short positions. Nonetheless, chances are that prices will be much lower come late August...aside from a few weather spikes here and there that is the typical pattern. 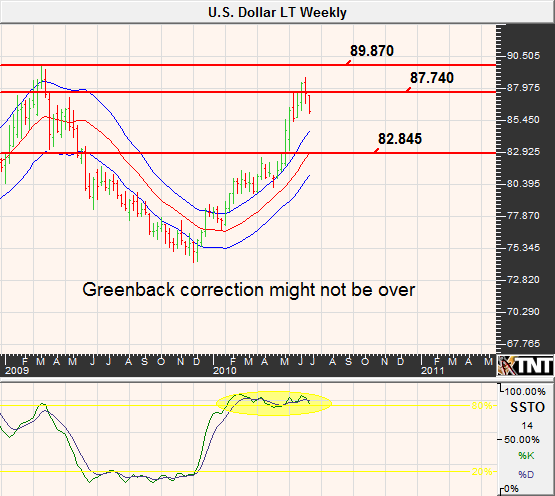 Another wildcard in any bearish grain plays is the possibility of further weakness in the U.S. Dollar index in the near-term. If the currency markets become Euro biased once again, any grain rally could be more intense. 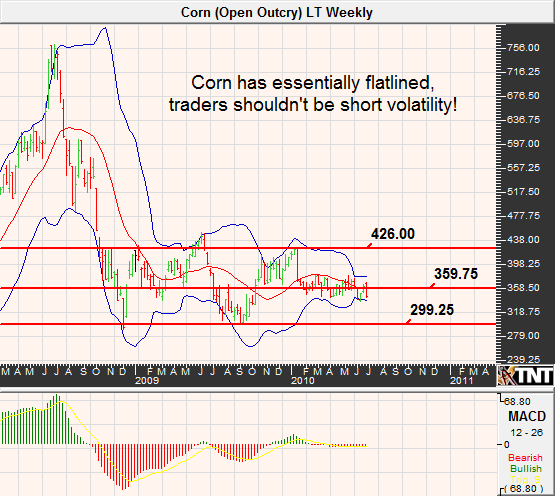 Last month we were looking for a short covering rally to bring corn to prices possibly as high as $4.00. As it turns out, July corn ran out of steam near $3.70 and now appears to be headed back to the $3.30 level. On June 10th, the USDA reduced its estimated 2010/2011 ending stocks to 1.573 billion bushels and this leaves the 2011 ending stocks to use ratio at a seven year low of 12%. However, global supplies for corn are a bit healthier, the USDA expects world ending stocks to use ratio to be about 18%. According to Jeff Caldwell of Agriculture.com, "Estimates for non-land costs to raise the 2010 corn crop in the central Corn Belt are seen at $452 per acre, down $114 per acre for a year ago, according to University of Illinois Extension economist Gary Schnitkey. Soybean per acre costs are seen around $300, down from $327 last year." This figure translate into about $2.74 per bushel in corn and $6.82 per bushel in beans. If you recall, just a few short years ago corn and soybean prices were far less than the current cost of production (excluding land) per bushel. This is a glaring reminder of the impact of energy prices and other inflationary pressures. The seasonal peak in corn is overdue, the current down move will likely see $3.30 but the market might struggle to make dramatically new lows. If you want to be a bear, look for a bounce back to the top of the trading range near $3.75 in September futures or be sure to buy insurance against any speculative short. All eyes are on the June 30th acreage report, and this could make or break the bean market. 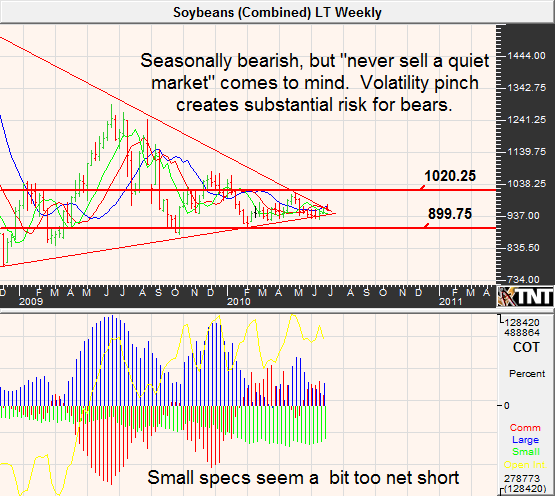 From a fundamental view, bean traders have reason to like the upside in prices. Most recently, the USDA revised ending stocks estimates lower to 360 million bushels from 365. July is a seasonally weak period for soybeans. However, just because the seed is in the ground doesn't mean that it is smooth sailing. Hot and dry weather in growing regions often sparks weather spikes throughout the month that can be treacherous for bears caught on the wrong side. Adding to the risk of a weather spike is the fact that small speculators are hugely net short. They tend to be the most fickle of the reported groups and should a spike in pricing occur, they will be quick to cover and force prices even higher. This type of move might not become a reality, but the circumstances favor it. Therefore, all bearish positions should be well hedged. A better play might be to patiently wait for an explosion in volatility before trying to play the downside in this market. Demand estimates for 2010 from both OPEC and the Department of Energy have been consistently near 85 million barrels per day. This is despite the reaction of crude oil traders as the European debt crisis unfolded. It seems as though the speculation of dramatically lower demand was more concept than reality...or at least an over-exaggeration based on the current climate. Last month we stated that there could be a floor in oil pricing in the mid to low $60 range and so far that has been the case. 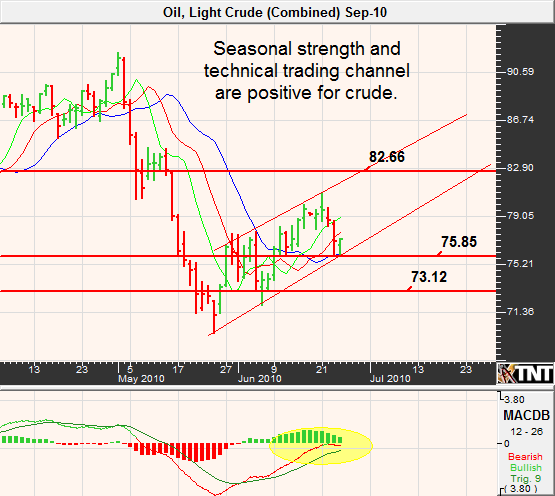 This month, we continue to lean higher overall; however, in the immediate-term, August crude will likely struggle near $82. That said, we have a feeling that the bullish momentum will grow as the dollar weakens and seasonal tendencies take hold. We wouldn't be shocked to see the mid $80's once again. 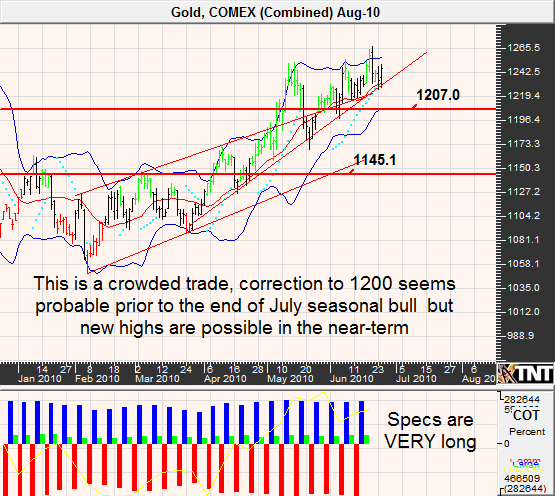 Gold prices normally don't get help from strong seasonals until late July; however, this year it hasn't seemed to matter. The gold bugs have gotten together to form a very large gold bull and nobody knows just when the charge might stop. Gold prices have broken all of the rules in the most recent rally. The precious metal rallied alongside stocks and picked up only moderate momentum on stock declines. Gold has also nearly forgotten its negative correlation with the U.S. dollar index; for most of May and half of June the two markets actually moved in tandem! We doubt that the disconnect from reality will last on the long run, but it sure does make it difficult to speculate in the short run. The obvious play seems to be a bull....but is the trend really our friend? We doubt it will be for long. Given the momentum and the fact that gold bugs won't go out without a fight, there will likely be at least one more price spike before gold prices can undergo a substantial correction. 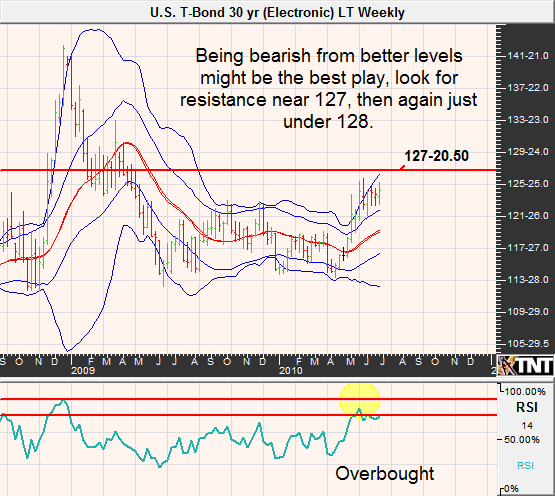 We see resistance near 1275 and then again at 1300 and begin getting bearish above the first level mentioned. If a correction ensues, we could easily see a move back to $1,200. The U.S. Dollar has given up some of its European Debt crisis gains as investors have scaled back their flight to quality plays in the currency arena. While we feel as though the fundamentals backing the greenback are favorable to most other currencies, we aren't convinced that the Euro short covering has run its course. If we are right, a looming short squeeze in the Euro could result in strength in other currencies and keep pressure on dollar index futures. Estimates vary widely, but most agree that growth in the Euro zone is only slightly positive. For instance, the first quarter GDP was reported at a meager .2% and after several sovereign debt downgrades in the region, it could be true that the worst is behind them...at least for now. From a longer-term perspective, we are bullish the dollar and bearish the Euro but we still feel like the trade is overcrowded and has some room to cause pain to the complacent. Last month we mentioned that the Dollar index could retreat to 81, but we are revising this to about 83 in the September contract. Things are moving much more slowly than we had anticipated, but they seem to be on track. In the case of the euro, we grossly underestimated the size of the selling. Nonetheless, the market eventually found a low and appears to be in a grind higher mode. 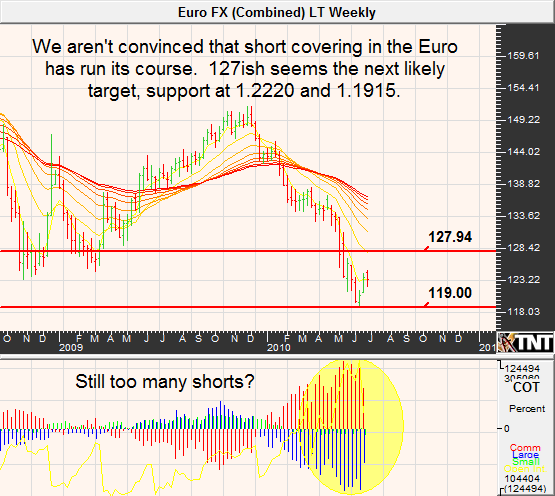 If we are right, look for the September Euro futures to make a move to the 1.27 area before running into resistance. Meanwhile, support is at 1.2220 and then again at 1.1915 if we are wrong about the upswing. We are headed into the peak harvest time in Brazil and India and sugar prices typically chop around during the month of July. That said, the seasonal bias overall is relatively supportive. Sugar prices have jumped back above its 50 day moving average and that shows some positive momentum but it will likely take supportive news to keep the move going. On June 3rd, the U.N. claimed that "Preliminary projections for (world sugar) in 1020/1011 indicate a small surplus for the first time since 2007/2008, providing some downward pressure on prices." On the same day, Czarnikow estimated that world sugar production would increase by 11% in 2010/2011 to 174.3 million tons. October seems to be on a path toward 17.50 or a little higher, in the meantime we see support near 15.42 and then again near 15 cents. In the last DeCarley Perspective, we warned of being a patient bear due to the tendency of coffee to experience dramatic "weather spikes". We also noted that the market had been range-bound up to that point in 2010 and that "we have a feeling that we are on the brink of a price restructuring in coffee". Nonetheless, we had no way of knowing the magnitude of the move that was looming, nor did we expect it to happen with seemingly no fundamental news to drive it. In case you missed it, September coffee futures soared approximately 40 cents over the course of 11 days. The move started on what most analysts were calling short covering ahead of what a select few were forecasting as potential freeze weather. However, from a weather standpoint nothing significant materialized. There was no freezing weather or any credible expectations that there would be in the upcoming futures. However, buy stops continued to be elected and market makers stood aside unwilling to sell into the moves. The result was the opposite of the equity market flash crash...only in coffee, the market hasn't' snapped back to reality. Despite the fact that the USDA is predicting record high production in 2010/2011, coffee is trading at prices seen only twice in the past 12 years. We feel as though it is only a matter of time before "all" of undercapitalized shorts are out and coffee prices can make their way lower. After all, the seasonal tendency calls for an early June spike and subsequent selling throughout August. The hog market was able to snap back from EU debt crisis selling in sympathy to some friendly data. Most recently, the USDA reported that hog and pig inventory was down 3.6% from a year ago and that frozen pork in storage was down 23% on may 31st from a year ago. However, the news is known and (we think) priced into the market. 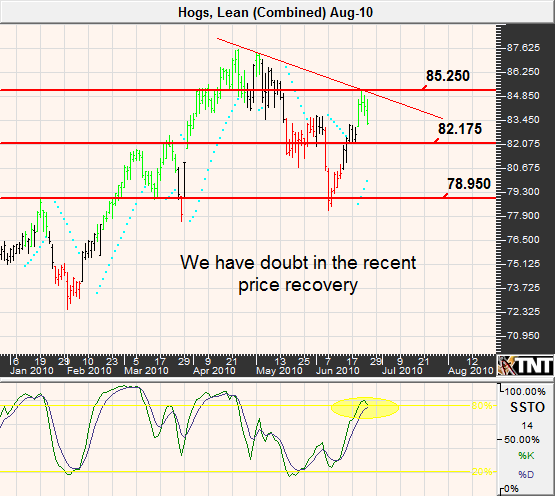 In light of seasonally bearish tendencies, it might be difficult for lean hog futures to maintain the recent gains. Last month we liked the idea of buying into dips near 76ish, this time around we prefer the other side of the coin. Look for "good" rallies to be a bear, we see resistance near 85.50 in the August contract and then again near 86.20 if "they squeeze the shorts". Cattle prices were unable to avoid suffering the consequences of European debt problems. The threat to the global recovery raised real concerns in regards to the demand for beef. As a result, cattle futures were nearly in freefall throughout the last two weeks of may. Although prices have stabilized, the bull hasn't returned...yet. 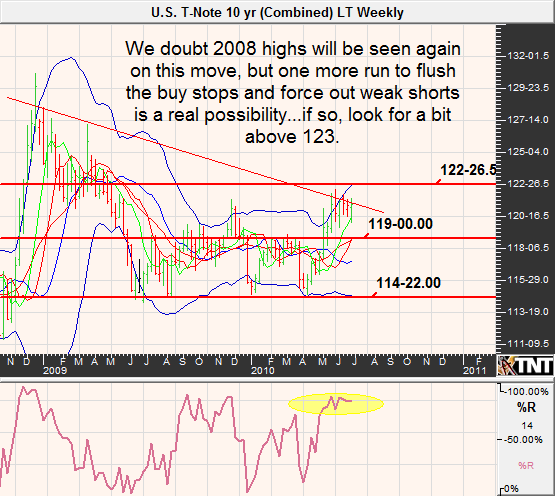 Prior to the European scare, cattle prices were arguably overbought and due for a substantial pullback. Therefore, we feel as though the move would have occurred with or without this particular event (but perhaps not as fast). Accordingly, we like the support area between 89 and 87 cents per pound and feel as though the path of least resistance will be higher from here. 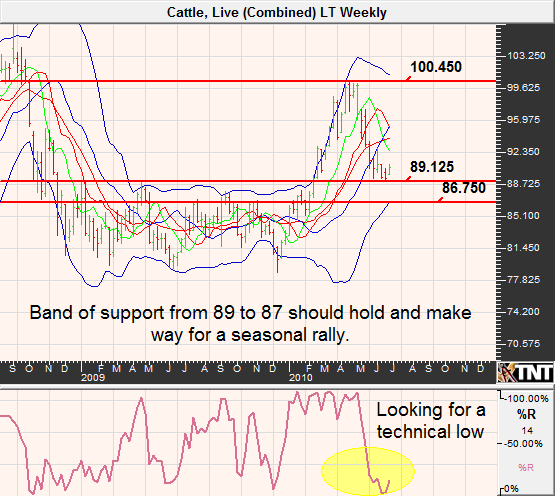 August cattle faces resistance near 90.75 cents, but we feel like 94 is attainable.